A state high court sitting in Awka has discharged and acquitted the two remaining suspects allegedly involved in the shooting of worshipers at St Philips Catholic Church Ozubulu on 6th August 2017. In a ruling that lasted for over three and half hours, Justice Fidelis Aniukwu ruled that the prosecution counsel could not prove beyond reasonable doubt the allegations leveled against the two defendants Mr Chinedu Akpunonu and Mr Onyebuchi Mbanefo. The judge further stated that the prosecution witnesses could not provide any evidence linking the defendants with the murder of the thirteen worshippers at St Philips Catholic church, Ozobulu as alleged. The defence counsel, Festus Kayemo, who was represented in court by another counsel, Samuel Echeakputa described the judgement as landmark considering the accelerated hearing granted by the presiding judge. Reacting to the judgement, one of the defendants, Chinedu Akpunonu whose joy knew no bound, thanked God for vindicating him from what he described as an attempt by some persons to dent his image and reputation. 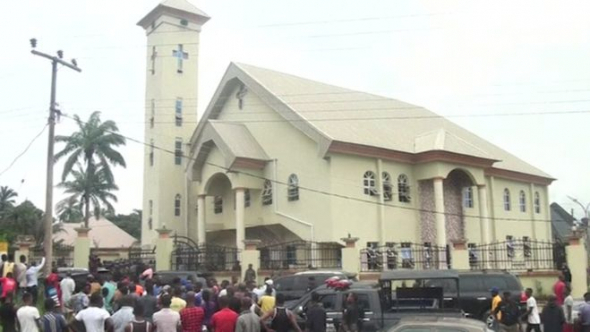 It would be recalled that four suspects were arraigned before a high court in November 2017 after an unknown gunmen attacked and killed thirteen worshipers at St Philips Catholic church Amakwa, Ozubulu in Ekwusigo local government area. The judge had in December 2018 discharged two out of the four persons standing trial for lack of evidence by the prosecution counsel to convict them. the investivative department in nigeria is so poor, how this guys be taken to court in the first place when there was no real evidence to prosecute. prosecution witnesses could not provide any evidence linking the defendants with the murder of the thirteen worshippers at St Philips Catholic church, Ozobulu as alleged. Congratulations to the suspects, If they’re actually innocent. But I’d they’re not, he that killed by gun shall a lii so die by gun. judgement is for the lord and i beleive he will surely judge this right, human have play there part but judgement is of the lord. Thank God for vindicating them and not letting them to be punished for what they no nothing about.